The Young Farmers’ Clubs of Ulster (YFCU) members recently participated in the public speaking competition finals 2018 which was held on Tuesday, November 6th at Magherafelt High School. Should NI Assembly Members salary be suspended? The judges listened intently to 101 speeches, and these were assessed according to platform manner, voice production and on the content and marshalling of facts. The judges were thoroughly impressed by a range of varied and entertaining speeches, thus had a difficult task due to the high standard presented. 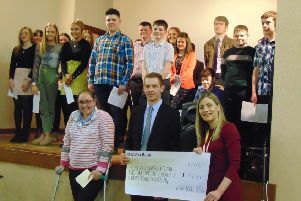 Guest speaker on the evening was Hannah Spratt, broadcast journalist at Q Radio, and Donaghadee YFC member. Hannah commended all the finalists on their public speaking skills, as she recalled her own experience of being in that position having competed previously. She went on to advise members how being part of YFCU has benefitted her career greatly in terms of her communication and teamwork skills. The YFCU would like to thank the sponsor NFU Mutual Insurance Society Limited, Robert Caldwell, guest speaker Hannah Spratt, the chairs, judges and trainers who helped throughout the competition, Magherafelt High School for their assistance during the final and finally the YFCU members who took part.